Want to become a better guitarist and have more fun practicing? Add circuit training to your guitar practice routine. Circuit training combines several exercises in a very specific way for a pre-determined period of time. It is time-efficient. You practice several techniques in the time most guitarists practice only one. This improves your guitar playing faster. It is fun. Circuit training breaks up the monotony of repeating the same exercise hundreds of times. It improves your guitar playing fluency. To use your skills in real music, you must combine a variety of guitar techniques. Circuit training makes you better at this. It keeps you focused. Frequent rotation of exercises makes it easier for your mind to concentrate. This makes your practicing a lot more effective. Attention: Warm up your hands thoroughly before practicing! Play a scale using legato for 7 repetitions (ascending and descending) at 80-85% of your top speed. Ascending and descending through the scale counts as 1 repetition. Play a palm-muted E power chord using triplets (3 notes per click) for 20 metronome clicks at 80-90% of your top speed. Use downstrokes only! Play trills (rapid alternation of hammer ons and pull offs on any pair of notes) at 80-90% of your top speed (vary the finger pair every 8 clicks on the metronome). Continue until you’ve gone 4 times through every finger combination. Play a string skipping lick (any lick of your choice) for 8 repetitions at 80% of your top speed. Play any 3-note-per-string scale (anywhere on the fretboard) at 20-40% of your top speed without using the index finger on the fretting hand (only use fingers 2, 3 and 4) for 3 repetitions. Play any scale sequence or rhythm guitar riff with double picking (pick each note twice) for 10 repetitions of the riff/scale sequence. Repeat this circuit without stopping for 15-20 minutes. Learn (for free) the best ways to build better guitar playing skills. Learn how to have fun as you become a much better guitarist. When playing legato, pick the first note on each string (and do hammer ons/pull offs for the other notes). Plan out the exercises (and metronome tempos for each exercise) in advance before starting to practice. Do NOT stop between each step of the circuit to figure out what exercise to use next and what tempo to set the metronome to. Have the list of your exercises/metronome tempos in front of you when you practice. Move from one step of the circuit to the next as fast as possible. The only delay should be to change your metronome to a new tempo (5-10 seconds max). After you finish all steps of the circuit, immediately start over from step 1 (without stopping or hesitating). Never play through pain! Feeling fatigue (dull, burning sensation in your hands) is normal, but sudden sharp stabs of pain are signs that something is wrong. Stop immediately if you feel pain. Note: circuit training is NOT a replacement for your regular guitar practice. Use it together with other guitar practice strategies to make faster progress. Integrate this circuit into your guitar practice schedule 2-3 times per week over the next month. Watch your guitar practice become more effective and more fun. The guys over at the American Academy of Guitar Mastery have been using circuit training in their guitar lessons and found their students improved their playing at a faster rate. Learn how to create guitar practice schedules the right way. 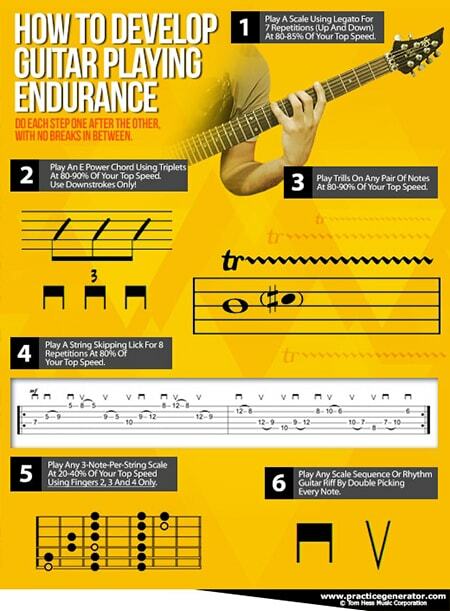 Learn how to practice guitar effectively.